The super popular Extremely Little Rabbit is teaming up with Otosan for these animated stickers! Friend SoftBank’s official account and answer a survey to get the set for free. 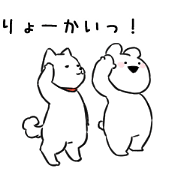 Copyright : Softbank | DK., LTD.
How to get GIFs animated and PNG with transparent background from LINE sticker?